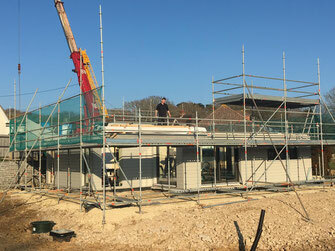 A new Stommel Haus home is coming to the UK: As from March 2019 another high quality, bespoke, eco home will be built in the UK, in Dorset. Our lovely clients already named their house "Heartwood" in reminiscence of their love for the house as well as the fact that the house is built with Nordic spruce heartwood. As there is already a Stommel Haus "Heartwood" in Aberdeenshire, we call this one "Heartwood of Purbeck". Stommel Haus clients value the eco credentials of the product, its energy efficiency, the fact that natural materials are used - strictly no PVC, no polystyrene, OSB panels or similar materials. 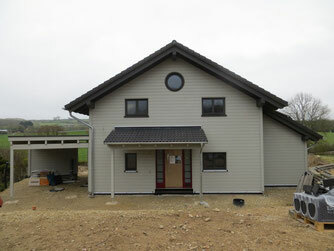 Our clients also value the fact that the house will be built quickly and for the agreed budget. The advantage of the off-site manufactured home is the fact that all cost can be calculated beforehand. 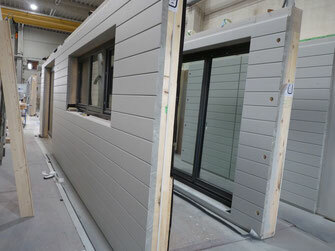 The panels which make the walls of the house are prepared in the factory in Germany. The tailor made triple glazing, high quality timber windows, the front and side entrance doors are installed properly into the walls, so the house goes up and is wind- and water tight within 5 to 7 days. Our Dorset clients had already seen a Stommel Haus home in the Black Forest in Germany, which their friends had built around 12 years ago. 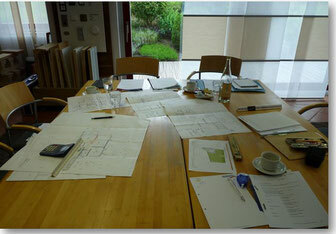 After the decision for Stommel Haus and obtaining the planning permission, our clients came to Germany for the fitting meeting, where all the details, from colours, flooring, taps and bathroom suites, electrics, heating, interior doors, the stair case and much more were discussed in much detail. The fitting meeting is hard work but great fun at the same time. 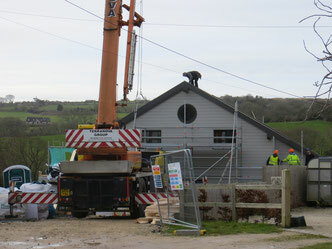 The slab was finished in time and the assembly started dead on time on the 27th February. At the end of day one, the ground floor was finished. February. Watch this space for more news. Walls in production hall: Ready for the installation of the windows. Then the walls get loaded onto the trucks. 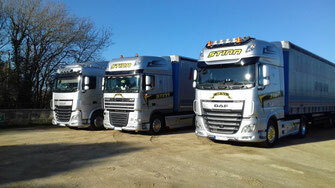 Lorries arrived the evening before start of assembly. Safely parked in close proximity to the site. End of day one: Ground floor is up. The weather is fantastic. Thank you, assembly team, for this fabulous work. This photo was taken by the owners during the build phase. The very bad weather with storm and torrential rain stopped the crane at several instances - however, the assembly team caught up with the project plan, so no delay on the finish date. Despite the very stormy, rainy and altogether horrible weather, the house is up in time. Interior kitting out has started, electrics is in and sanitary and heating installation is in full swing.